Cant Open Hood - Help! ^^^ You two have the same hoods, etc. Maybe post a few pic for the guy that would help him see how and where to reach in with a coat hanger (or he goes and buys something stronger, like a piece of 3/16" steel rod, or whatever) and pull on the latch release. I'd do it myself if I had a similar year, baring that I'd have gone to a used car lot or a JY for a look + photoshoot. I'd also move my brothers truck out of the garage, be it under it's own power, with a good push, or drag it outside with a chain, and park mine inside. I appreciate the consideration for photos. Also Skylark, I appreciate your help too. You have a point about my brother's truck. The engine is out of it because of anti freeze leaking into the engine. Because my bank account is in limbo too, I likely won't be able to buy and use a new release cable untill next weekend. Update: Was reading on a forum (this one or another) where a guy said he used an open ignition wrench to get the bolts out of the grill. He then apparently removed some trim behind the grill, then had access to the latch. Hope someone confirms I can do this without damaging anything. Re: Cant Open Hood - Help! If you have a 1/4" drive socket set with a swivel you might be able to get the 2 screws out of the latch enough to raise the hood to unlatch it. the first pic I posted shows the latch, 2nd i'm pointing to the piece the cable hooks into with a screwdriver. basically reach through the middle of the grille, get your thumb onto the inner latch ( has a spring hooked into it ) and push it towards the drivers side of the truck. the hood will pop open. Thank you very much for your effort sir. It's appreciated. I actually had an appointment set up to do rear brakes tomorrow and totally forgot that my mechanic would need the hood open. "DOH"!.....Well the truck is at the shop so I'll call him in the morning to explain it to him. Brother, here goes 50 more bucks in labor and a long day. Well guys, I regret this whole thing. From the start, I should've stopped once I knew the cable was bad. My mechanic ripped me off. 105 for a release cable, 72 for labor. The same guy who did a pinion seal for 110 when someone else quoted me 180. Here I thought I had a good mechanic. Had I just manned up in the cold and found a way to open it before I tried to have brakes done, I'd be good. Bought brakes for 120 and quoted me 180 for labor. I declined to have it done seeing as how he got me on the cable. Upset. Half my mistake, and a loophole by the mechanic. I know it has been awhile since this solution was posted, but felt it was important to make a correction since anyone trying to do what was stated would have no luck opening their hood. That's because, while your photo was helpful, what you said in your post doesn't make sense. 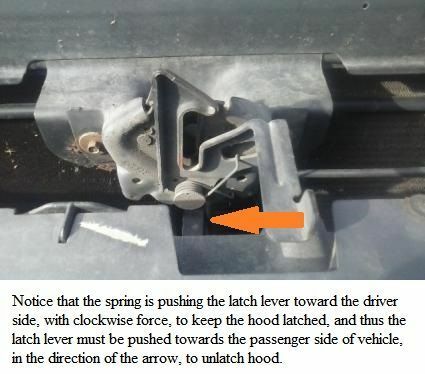 Referring to your own photo of the latch, it is quite apparent that the latch lever must be pushed toward the passenger side of the truck to unlatch the hood. Last edited by Rick Rickoff; 07-31-2018 at 08:07 AM. They figured it out a year and a half ago.